The Embree Example Renderer is a photo-realistic path tracer that builds on the Embree high performance ray tracing kernels. The renderer is used to demonstrate how Embree is used in practice and to measure Embree's performance in a realistic application scenario. The Embree Example Renderer is not a full featured renderer and not designed to be used for production rendering. The Embree Example Renderer is released as Open Source under the Apache 2.0 license. In case the Windows reports a missing MSVCP120.DLL please install the Visual C++ Redistributable Packages for Visual Studio 2013. If you encounter bugs please report them to the GitHub Issue Tracker for the Embree Renderer. For compilation under Windows you first have to install the Embree ray tracing kernels including the Intel® SPMD Compiler (ISPC). After installation you have to set the EMBREE_INSTALL_DIR environment variable to the root folder of Embree. Use the Visual Studio 2008 or Visual Studio 2010 solution file to compile the Embree Example Renderer. Inside Visual Studio you can switch between the Microsoft Compiler and the Intel Compiler by right clicking on the solution and then selecting the compiler. The project compiles with both compilers in 32-bit and 64-bit mode. We recommend using 64-bit mode and the Intel Compiler for best performance. To enable AVX and AVX2 for the ISPC code select the build configurations ReleaseAVX and ReleaseAVX2. You have to compile the Embree kernels with the same or higher instruction set than the Embree example renderer. By default, the solution file requires ISPC to be installed properly. For compiling the solution without ISPC, simply delete the device_ispc project from the solution file. To compile the Embree Example Renderer using CMake create a build directory and execute ccmake .. inside this directory. CMake build options for Embree Example Renderer. BUILD_SINGLE_RAY_DEVICE Single ray rendering device for CPUs. BUILD_SINGLE_RAY_DEVICE_XEON_PHI Single ray rendering device for the Intel® Xeon Phi™ coprocessor. BUILD_ISPC_DEVICE ISPC CPU rendering device operating on ray packets of size 4 (SSE) or 8 (AVX). BUILD_ISPC_DEVICE_XEON_PHI ISPC Xeon Phi rendering device operating on ray packets of size 16. BUILD_NETWORK_DEVICE Network device to render on render server. When enabling any ISPC renderer, you also have to install ISPC. If you select BUILD_ISPC_DEVICE, you should select which instructions sets to enable for ISPC (TARGET_SSE2, TARGET_SSE41, TARGET_AVX, and TARGET_AVX2). All target ISAs you select when compiling the Embree Example Render, have also to be enabled when compiling Embree. Due to some limitation of ISPC you have to enable more than one target ISA if you also enabled more than one target ISA when compiling Embree, otherwise you will get link errors. If you installed Embree, CMake will find it automatically and set the EMBREE_INCLUDE_PATH and EMBREE_LIBRARY variables. If you cannot install Embree on your system (e.g. when you don't have administrator rights) some additional configurations are required to use Embree from its build folder. Set the EMBREE_INCLUDE_PATH to the embree_root_directory/include folder and the EMBREE_LIBRARY to embree_root_directory/build/libembree.2.3.2.dylib for macOS or embree_root_directory/build/libembree.so.2.3.2 for Linux. Under Linux you have to additionally add embree_root_directory/build to your LD_LIBRARY_PATH (and SINK_LD_LIBRARY_PATH in case you want to use Embree on the Intel® Xeon Phi™ coprocessor). Press c (for configure) and g (for generate) to generate a Makefile and leave the configuration. The code can now be compiled by executing make. The executables will be generated in the build folder. A window will open and you can control the camera using the mouse and keyboard. Pressing c in interactive mode outputs the current camera parameters, pressing r enables or disables the progressive refinement mode. The navigation in the interactive display mode follows the camera orbit model, where the camera revolves around the current center of interest. The camera navigation assumes the y-axis to point upwards. If your scene is modeled using the z-axis as up axis we recommend rotating the scene. 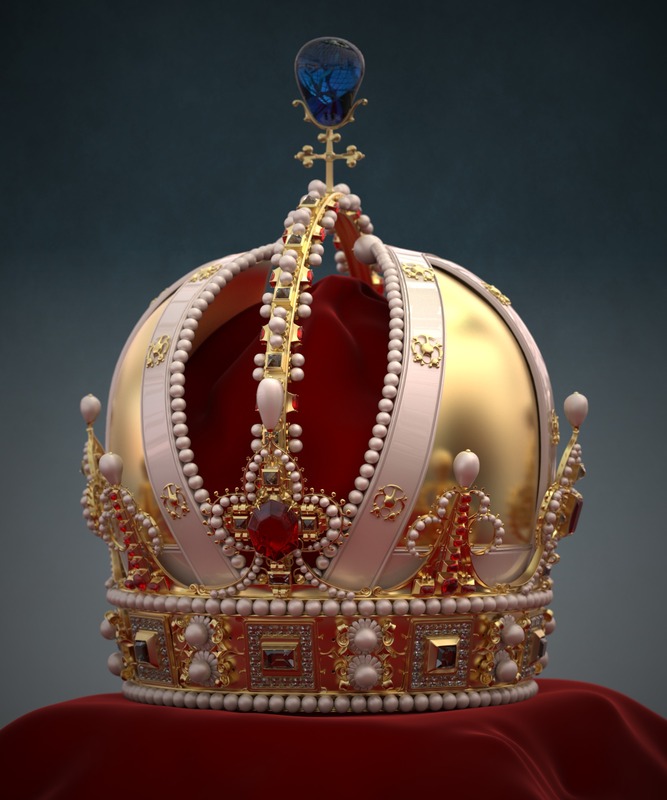 We provide also a more advanced model of the Imperial Crown of Austria to test the renderer with: Crown0413.zip (74MB).